Would you like to keep your Beagle healthy and happy throughout his life? In that case, you should choose to purchase only the best dog food for Beagles for your doggy friend. After all, the best food is curated especially for the breed and contains the right balance of all the important nutrients. I can understand how difficult it can be for one to look for the best dog food for their furry companion—after all, there are so many different foods on the shelves! Fret not, because I’ve got you! In this blog post, I have decided to compile a list of the best dog foods for Beagles in 2018 and share a thing or two about your Beagle’s nutritional needs and requirements. After all, our goal is to keep your furry friend healthy and happy! Like I mentioned in the introduction, I have compiled a list of the best dog foods for Beagles available to buy in 2018 and in this section, I’d like to share these with you. Don’t worry, this isn’t all! I will review each of these dog foods in detail a little later in this blog post. Here at PetDt, we follow strict criteria when rating a dog food item. We just want your doggy friend to get the best! I would like to share a few things about your Beagle’s nutritional needs with you. Don’t worry, I won’t go too much into detail about things. Beagles come in not one but in two sizes 13 and 15 inches! The dog is measured at withers to determine its size. There isn’t a desired breed standard weight 20-25 pounds, which, obviously, also depends on the height to a certain extent. But, pet Beagles are known to weigh quite a lot—owing to their love for food. So, naturally, obesity should be a concern for every Beagle owner. That’s why you should always make sure that you aren’t overfeeding or underfeeding your furry friend. And you must inculcate some form of exercise in your dog’s daily schedule. Obesity can actually shorten your doggy friend’s lifespan significantly as the disease brings with it other medical issues. According to the National Research Council of the National Academies, the daily average caloric intake of a Beagle must be 1010 for a 25-pound adult dog. However, dogs that are older, spayed, or less active need a significantly less amount of calories. Puppies and teenage Beagles, on the other hand, need more calories. Although to determine the right amount of calories, I urge you to visit a vet as they can make a prediction more accurate based on your doggy friend’s activity level, metabolism, special conditions, age, etc. Keep in mind that the values mentioned above are a minimum. Ideally, you must try to find a dog food which exceeds the above-mentioned limits. The more the protein, the healthier the food is. Even though people these days have a phobia of fats, I would like you to know that fat is actually good for your furry friend. The omega-3 and omega-6 fatty acids help with your dog’s skin, fur, heart health, and brain! And, it also enhances the flavor of the dog food! A generally healthy breed, the Beagles go through only a few health issues throughout their life—which can be avoided completely if they’re fed right and live a good and healthy lifestyle. Hypothyroidism is one of the most common (and avoidable) health issues faced by the Beagles. The course of treatment requires a daily intake of the thyroid hormone and is a manageable condition. These dogs should be kept on a grain-free and low carb diet for the best results. Beagles are—as I mentioned earlier—prone to getting obese. This is why the breed requires to have a proper feeding schedule and shouldn’t be allowed to free feed at all. In this section, I would like to go through the ideal feeding schedule for Beagles. During the first 4 weeks of life, the Beagle puppy must exclusively be given its mother’s milk and the process of weaning must begin after week 4 as solid foods are slowly introduced to the doggy. Beagle puppies must ideally begin the intake of mainly solid foods by the age of 6 weeks. Beagle puppies nurse every few hours and should be given 5-8 meals a day during the process of weaning. Make sure that there aren’t many changes made to the puppy’s diet during the first few weeks as they may cause digestive issues. If you do have to switch food brands, make sure to mix the old and new feed together and transition to the new feed in a slow and steady manner. As the puppy is at a growing stage, he would be hungry and eager to eat. Make sure that you feed at least 3 meals per day and avoid free feeding altogether. The number of feeds per day should be eventually reduced to 2 meals per day—one in the morning and one in the evening. But, keep in mind that the calories from treats also count! Your dog’s metabolism will start to decrease as he steps into adulthood and you may need to decrease your doggy friend’s nutritional intake as well. As I mentioned earlier, the calories that your doggy gets from treats also counts! So, make sure that you don’t give your dog unlimited treats between meals! Every dog breed has nutritional needs unique to it. So, it is clear that not all dog foods would be suitable for your Beagle and won’t meet his nutritional requirements. You can go for dog foods that are designed to cater the needs of the breed or, you can do your research and find some good dog foods that’ll be suitable for your doggy friend’s needs. In this blog post, I have chosen to include some of the best dog foods for Beagles that aren’t necessarily marketed for the breed. Let’s talk about these foods in detail, shall we? 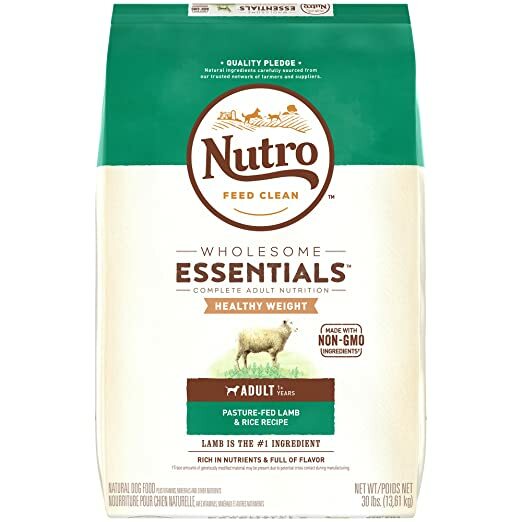 When assessing the kibble by just the quality of ingredients it contains, I feel that Nutro Lite and Weight Management Adult Dry Dog Food is an average dry dog food. The good quality of the ingredients in this dog food make it one of the best dog food for Beagles available in the market. We need to make sure that the macros on this one fall in the acceptable limits for this dog breed as well! I am of the opinion that this dog food is best suited for Beagles that are either adults or are aging as it contains a comparatively lower amount of protein. There’s one more thing we need to also consider to make a well-informed opinion of this dog food. Yes, the content of meat it has! To assess the protein content in this dog food, we need to single out the protein-boosting effects of all the plant-based ingredients that it contains. We came to the conclusion that this kibble contains a moderate amount of meat in it. Let’s finally weigh the pros against the cons, shall we? All in all, I feel that this kibble deserves the top spot in my list of the best dog food for Beagles. 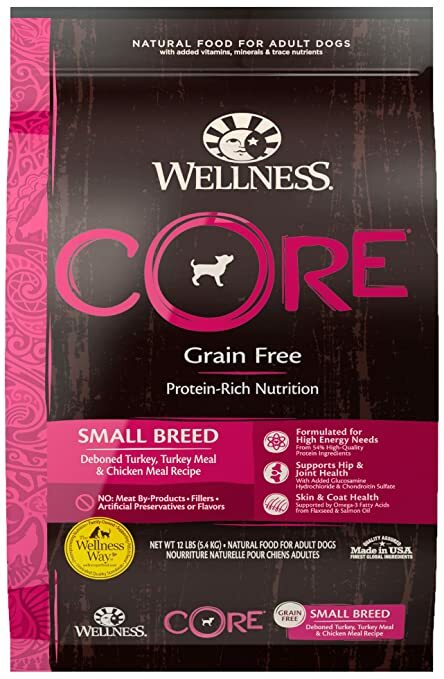 If we assess Wellness CORE Natural Grain-free Dry Dog food by just the quality of ingredients used to develop it, it comes out to be an above-average kibble. Let’s take a peek at the proportion of macros, shall we? All in all, the numbers suggest that this dog food is a good choice for the adult as well as senior Beagles. There’s one more consideration we need to look at. The content of meat in the food! After we tried and single out the protein-boosting effects of plant-based sources, we determined that this dog food contains a significant amount of meat in it. 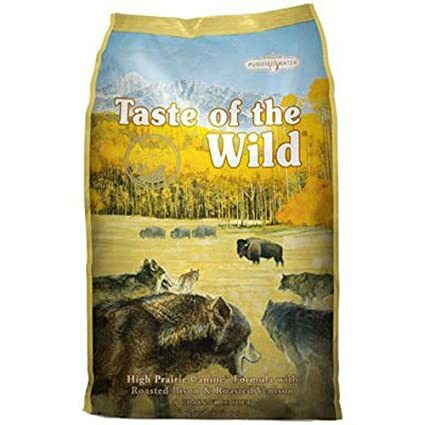 While assessing the Blue Wilderness Rocky Mountain Dog Food by just the quality of the ingredients used in it, it came out to be an above-average kibble in comparison to other dog foods available in the market. There are a combination of factors we assess in order to determine whether or not a dog food is worth investing your hard-earned money in. Let us take a look at the macronutrients, shall we? All in all, I feel that these macros are ideal for an adult Beagle as the fat and protein are both within the acceptable limits. There’s one last thing which you need to consider in order to make your decision about this dog food. The content of meat, of course! 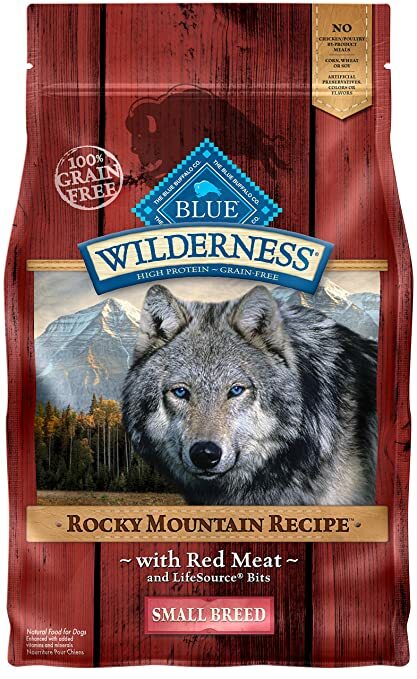 When trying to single out the amount of protein found in the plant-based ingredients it was found that Blue Wilderness Rocky Mountain Dog Food has a notable content of meat in it. Now let’s finally look at the pros and the cons of this dog food so that you’re aware of what you’re getting into. When you look at just the quality of ingredients that Taste of Wild Canine Formula contains, it comes out to be an above-average dry dog food. So, this food is known to contain good-quality ingredients. However, there are a few more things we need to assess in order to make sure that this dog food deserves to be on our list of the best dog food for Beagles. I really feel that this dog food is a good choice for small to medium dog breeds such as the Beagle. Let’s take a look at the meat content, shall we? After singling out the content of protein in plant-based ingredients, it was found that this dog food contains a significant amount of meat in it, which is amazing for hunting dogs such as the Beagle. I feel that this is one of the good and cheap dog foods available in the market. May cause allergic reactions such as itching, redness, sores, etc. 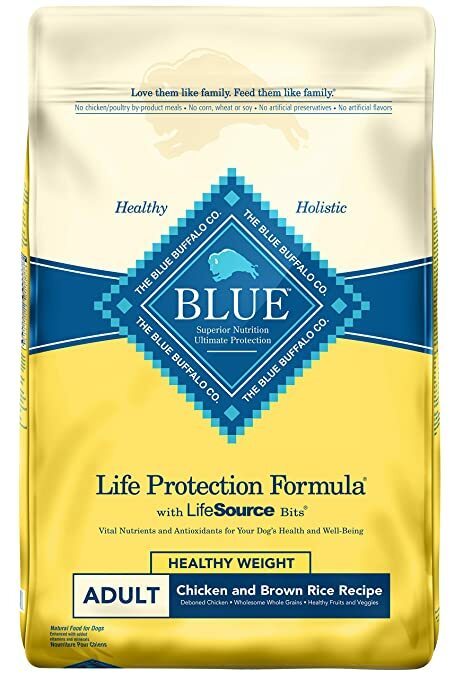 When we assess the Blue Life Protection Formula Adult Dry Dog Food by the quality of the ingredients used to make it then, it most definitely is an above-average dog food in comparison to the other dog foods available to buy in the market. But, that’s not all that we should look at, right? By just looking at the macronutrients, I can say that this dog food is a good choice for Beagles that are inactive or aging. The low amount of protein and fat does well to dogs that have a slower or aging metabolism. However, that’s not all, folks! When we single out the protein-boosting effects of plant-based ingredients we come to the conclusion that this dog food contains a moderate content of meat which is excellent. Let us finally take a look at the pros and the cons, shall we? Keep in mind that Beagles should get 80% of their nutrition from kibble and the rest 20% should come from treats. I recommend nutritional treats such as bell peppers, olives, tuna, etc. I would recommend you to consult your vet before making any changes to your furry friend’s diet as they know best. If you have any doubts or questions, please feel free to leave comments and we’ll get back to you as soon as we can! You might also like : Top 10 Affordable Dog Food – 2018 Check Self Pet Care.